Grammarian of the evening, Gerald Goh, CC, ALB, injected humour as he introduced the Word of the Day, 'coherent'. It means to be logical and well-organized. First time being the Ah Counter & 'Who Said What', TM Ida Mahmud gave a very detailed report of our unconscious use of crutch words. Timer & Tip for the evening, Aziman Nasir, ACB, ALB, urged the speakers to follow the lights of the timing device and to stop on the red so as not to spoil our speeches. With the new Pathways in full swing, it is a treat to witness advanced members present their 'icebreakers'. Tonight, we had the pleasure to listen to Hazwan Kamarulzaman, ACB, ALB, as he propelled us 'over that wall' and shared with us the many road blocks he overcame to finally enjoy the sweet taste of victory. 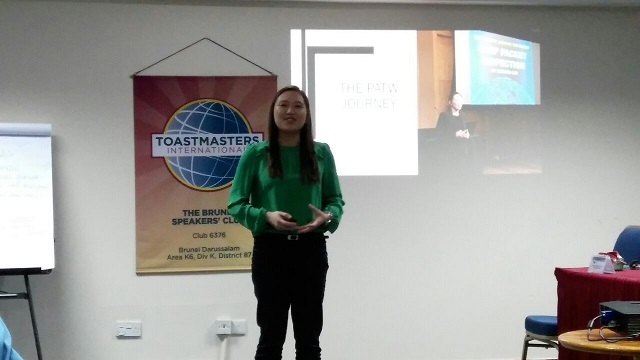 Our second speaker tonight was TM Supatra Lee who shared her 'Present Around The World' journey. 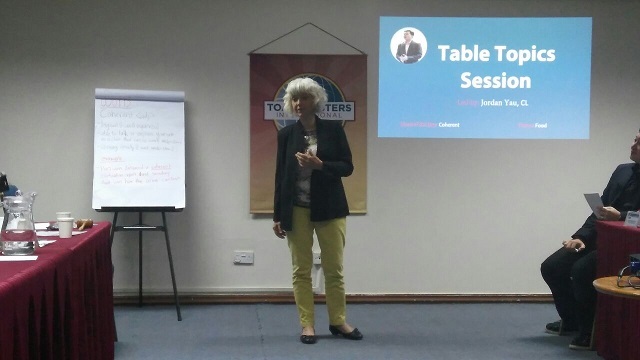 She spoke very candidly of the lessons she learnt along the way, of the importance of knowing how to filter feedback, of believing in the topic, and having the support of the Toastmasters. Humbled by the experience, knowing she did her very best, Supatra aspires to being on the international stage on day! 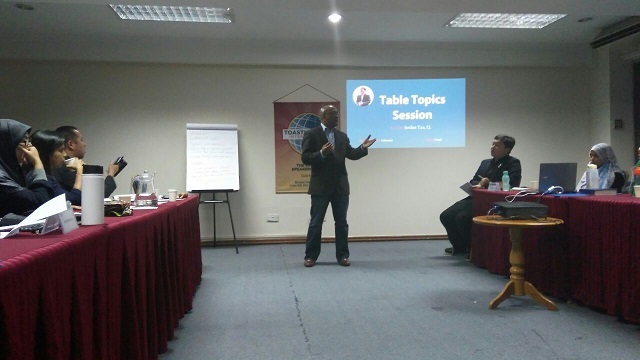 Table Topics Master (TTM), Jordan Yau, CL, delighted us with a series of carefully crafted topics revolving around food. Beaming with pride, Rahul Breh, CC, declared that prawn sukka is one of his favorite dish that his wife cooks for him. Asked about an uncommon dish, Mark McKenzie, DTM, and visiting member from a Toastmasters club in Kuala Lumpur, talked about the ackee and salted cat fish as being the dishes he misses the most from his home country, Jamaica. What would Amran Jamaluddin, CC, eat on a $2 budget lunch? Surprisingly, Amran would happily eat fried fish in soya sauce. Ask Pooja Shivanand, CC, ALB, about the most expensive meal she has ever had and you’ll think that she has been preparing for it. Straight of the bat and with great animation, Pooja told us all about the what, when, where, how and with whom she had that meal! The evening’s prepared project and impromptu speech evaluators were Rahmat Tarsat, CC, and TM Heidi Rahman, respectively. 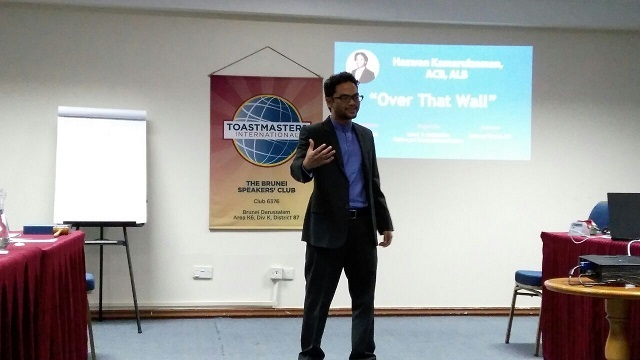 During the speech evaluation of Hazwan’s Ice Breaker for Level 1 Pathways in Presentation Mastery, Rahmat challenged him to show emotion, and to not think about how words should be said, but to instead trust his speech would speak for itself. With great animation and enthusiasm, Heidi Rahman presented a personalized evaluation for the 6 Table Topics speakers. Tonight, we welcomed a visiting member, Allen Ang, DTM, all the way from Brunei Advance Speaker Club (BASC), as our General Evaluator. In his usual detailed manner, Allen was able to highlight our greatest strengths and to slide in some recommendations and easy suggestions to carry the club forward. Before closing the meeting, our dear President Pooja called upon the winners of the Area Humorous Speech and Speech Evaluation Contests to be recognized by the club members to briefly share their experience. The ribbon winners tonight were Geneviève (Best Table Topics) and Rahmat (Best Evaluator).